This article is about the year 306. For other uses, see 306 (disambiguation). Year 306 (CCCVI) was a common year starting on Tuesday (link will display the full calendar) of the Julian calendar. At the time, it was known as the Year of the Consulship of Constantius and Valerius (or, less frequently, year 1059 Ab urbe condita). The denomination 306 for this year has been used since the early medieval period, when the Anno Domini calendar era became the prevalent method in Europe for naming years. Constantius Chlorus undertakes a punitive expedition against the Picts beyond the repaired Hadrian's Wall. His son Constantine joins him on campaign and they win a brilliant victory. July 25 – Constantius Chlorus dies outside Eboracum (modern-day York). Constantine, age 26, is declared Augustus (emperor) by his troops. Eventually Emperor Galerius grants Constantine the title Caesar and elevates Flavius Valerius Severus (Severus II) to co-emperor of the Western Roman Empire. October 28 – Maxentius, son of the former Western Emperor Maximian, joins a revolt by the Praetorian Guard in Rome, and is proclaimed Emperor. Southern Italy, bitter over the subjection to taxation, supports Maxentius, as do Africa, Corsica, Sardinia and Sicily. Galerius sends Severus to suppress the rebellion in Rome. The soldiers desert him and Severus flees to Ravenna. 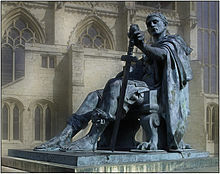 The Franks cross the Rhine, but are repulsed by Constantine. The Baths of Diocletian are dedicated; the thermae become the largest imperial baths in Rome. Galerius has the Rotunda of Galerius built in Thessaloniki (Macedonia). The War of the Eight Princes ends in China. Probable date – The Synod of Elvira concludes with the issue of various canons, including one declaring that killing through a magic spell is a sin and the work of the devil. Metrophanes becomes bishop of Byzantium. The Patriarchate of Lisbon is established. Christianity is established in Roman Britain. British bishops participate in the councils of Arles (314), Nicaea (325) and Arminum (349).